Do find it difficult to focus on your game after a soccer referee makes a bad call against your team? Do your emotions interfere with your play after a phantom foul is called against you? 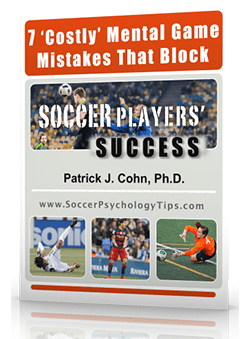 You and an opposing playing are going for a ball that you clearly get to first… The opposing player flops and the referee awards the opposing team a free kick. You become outraged and heated over the bad call and argue with the referee only to get a yellow card. The rest of the game you play tentatively to prevent your ejection from the game and rendered yourself relatively ineffective for your team. Research indicates crowd influence, or noise, can possibly contribute to the phenomena known as ‘home-field advantage‘ in sports, by influencing referees’ decision making. In the opening game of the 2014 World Cup, host country Brazil faced off against Croatia. Brazil had home-field advantage playing in Sao Paulo in front of more than 62,000 fans. Croatia took the early lead scoring a goal nine minutes into the game but Brazil but managed to score before the end of the first half to tie the game 1-1. During the second half, the referee awarded Brazil a penalty kick for a phantom foul in the box despite only incidental contact between the players. The penalty kick resulted in a goal giving Brazil a 2-1 lead. The referee proceeded to make another debatable call disallowing a Croatian goal that would have tied the game. Brazil ended up scoring a third goal and won 3-1 in controversial fashion to lift the hosts into the top slot in Group A.
Croatian coach Niko Kovac was appalled by the officiating in their game against Brazil. So what’s the resolution to bad calls or bias for home teams? There are some negative responses such as arguing or intentionally fouling opponents which could result in your dismissal from the game. 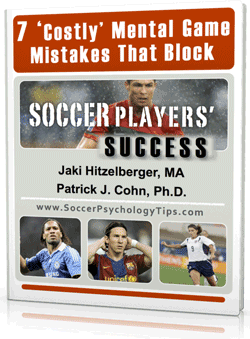 You could allow your frustration or anger to get the best of you and interfere with your performance on the field. But you need to keep your emotions in check, focusing on your next touch and look for opportunities to make plays on the field. It may not be easy in the heat of battle but the alternative (negative responses) only serve to give the opposing team an advantage. Tip #1: Prepare mentally for the fact that bad calls will be made during games. There is a subjective element to officiating… How will you effectively respond when this happens so it does not hurt your game? Tip #2: Prior to games, choose how you want to respond to these types of situations. Play out a scenario in your head. See yourself responding with composure, refocusing on the next play, and using it to positively fuel your play on the field. 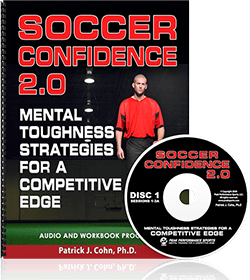 Improve your mental game in soccer today with our Soccer Confidence Workbook and CD Program!